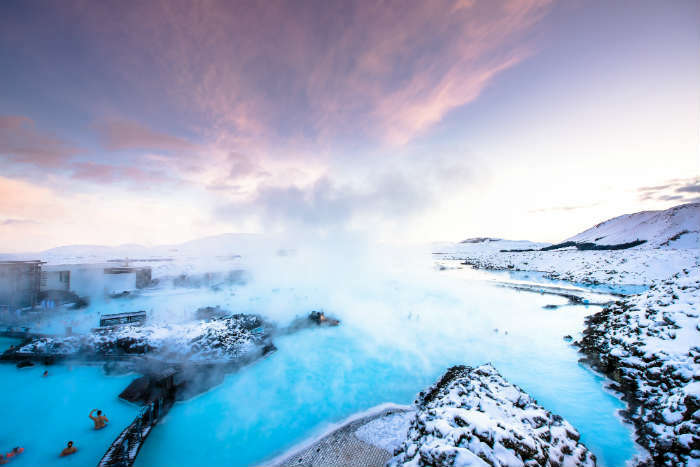 From the Blue Lagoon in Iceland to the home grown hot springs in Bath, thermal pools are a place to relax, soak aching muscles and refresh from everyday life. Just imagine it, it’s a slightly chilly day outside but you can see the steam rising from the blue pool of water welcoming in guests like a big warm hug. Yes, there’s just something magical about these places and here are some of the world’s most amazing thermal pools. The Blue Lagoon Geothermal Spa, probably one of the most famous thermal pools in the world is well worth a visit if you’re in Iceland. It doesn't matter if it’s snowing outside either as the beautiful blue water is a particularly cosy 38°c. Make sure you find a tub full of silica as well, this natural mineral is filtered from the water and makes the perfect face mask for smooth, soft skin! This striking spot in the middle of Budapest’s City Park, has been a popular hive of activity since 1913. 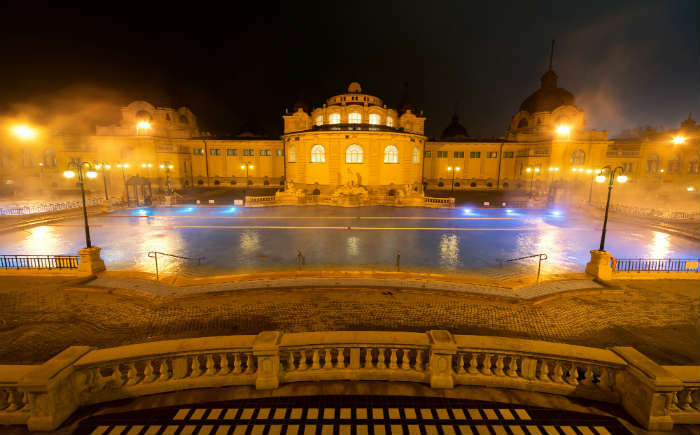 People have flocked to these baths for many years and are still a big attraction today because of the ornate neo-Baroque, yellow palace type building and the huge selection of indoors and outdoor pools. 18 pools, 10 saunas and steam rooms make up this huge complex which is more than worth a visit if you’re in Hungary’s capital city for a few days. Based in the Maremma area of Tuscany, Terme di Saturnia is said to have been created when Saturn threw lightning bolts down to earth in a bid to stop every one fighting. This created a hole in a volcano crater and that hole is now home to Terme di Saturnia Spa and thermal pools. 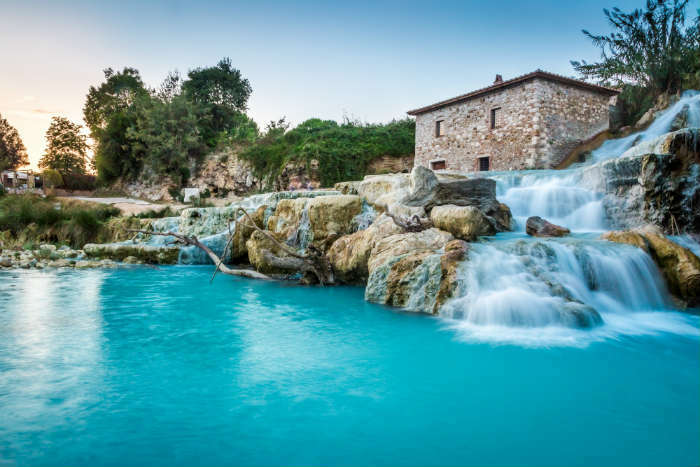 The water reaches a relaxing 37.5°c and you can lounge in the free cascading waterfall of pools or treat yourself and go in the world famous Terme di Saturnia Spa where a day of luxury awaits. 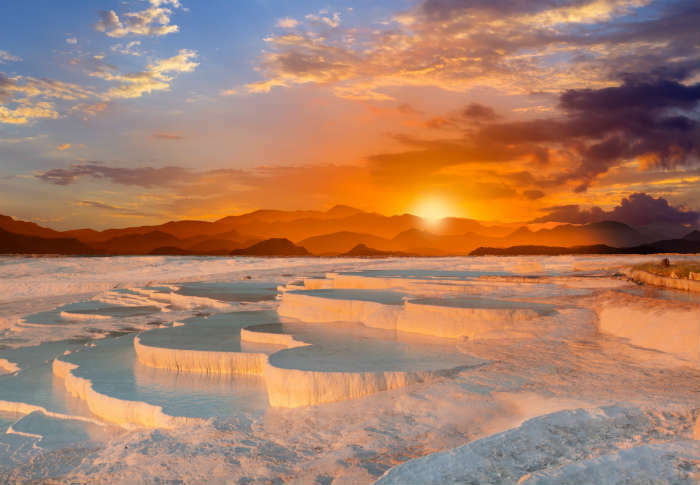 At first sight, you’d be forgiven for thinking that Pamukkale is a mountain of snow but in fact this “cotton castle” is in fact a series of pools coated in white minerals that create a “snowy” effect. 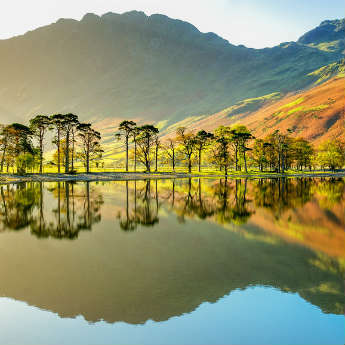 This place is best seen at sunrise and sunset where guests can bathe in the warm pools and be free of crowds but is just as atmospheric in the day time where you can lounge around in the warm waters and soak up the sun. Palia Kameni is an island off the coast of Santorini, next to Nea Kameni two islands which are well known for their natural thermal pools. The water, which is good for your skin due to the sulphur content, is generally around 33°c and makes for a relaxing break on a day trip around these islands in the Santorini caldera. Bali’s Banjar Hot Springs, near Lovina Beach, are well known around this exotic destination and are a popular hot spot all year round. It’s recommended to get here as early as possible if you can as the pools, which are 37°c in temperature, can get busy. 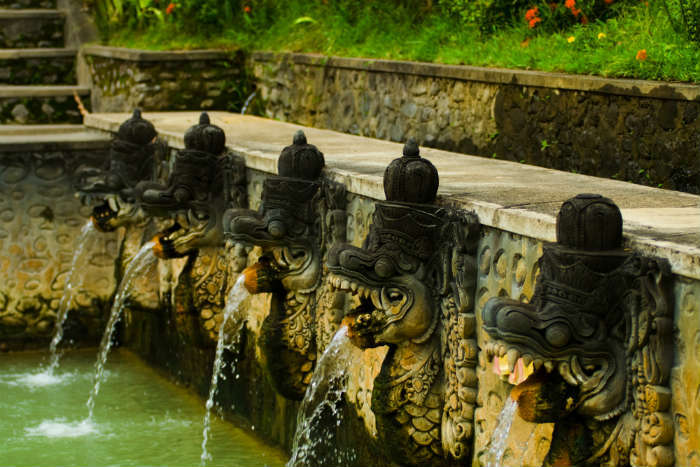 However, there’s plenty of space for everyone to spread around as there are several pools filled with water spouting from 8 stone carved Najas, a mythical dragon like creature! Whether it’s the snowy winter or the warm summer when you’re visiting Banff, Banff Upper Hot Springs are a real delight on a trip to this Canadian destination. 20 years ago, this hot spring was renovated to its original 1932 appearance and now provides an authentic heritage experience as well as a place to soak those muscles in warm 40°c water! 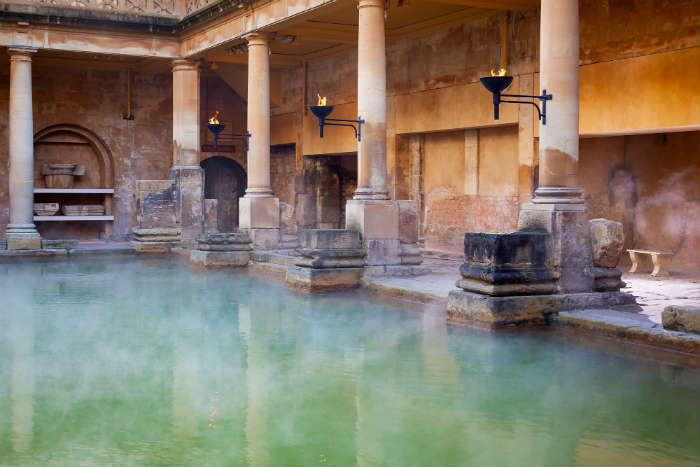 A little bit closer to home, Thermae Bath Spa in the Roman town of Bath is one of Britain’s original natural thermal spas. Over 2000 years ago Romans and Celts used to bathe here in this very water which used to be one of the largest thermal pools outside Rome. If the history doesn’t interest you, then just to tempt you a little bit there’s an outdoor, rooftop pool here with amazing views of the city of Bath. 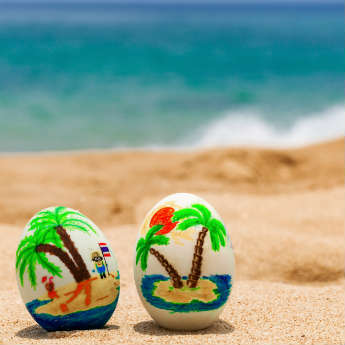 Don’t worry about being cold though, the water is naturally a toasty 34°c. If you happen to be travelling across the globe at some point in the future, see if you can plan in a little stop at Hot Water Beach. 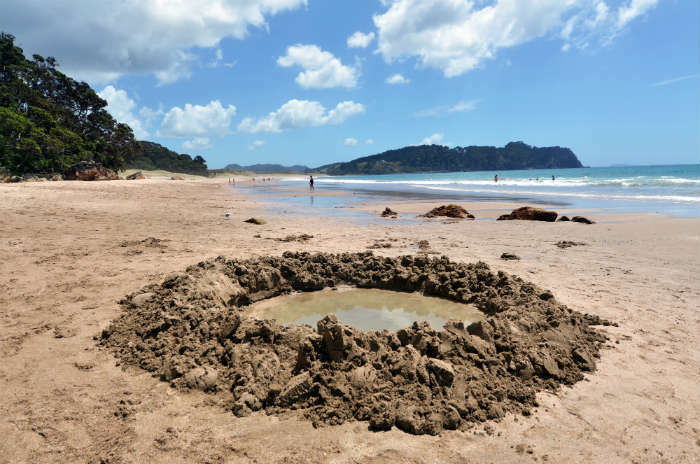 This unique stretch of coast in New Zealand allows visitors to dig into the sand and watch naturally heated mineral water bubble up through the beach. It’s a great way to make your own spa pool and works best when you dig into the sand two hours either side of low tide. Have you been to any of these thermal pools before? 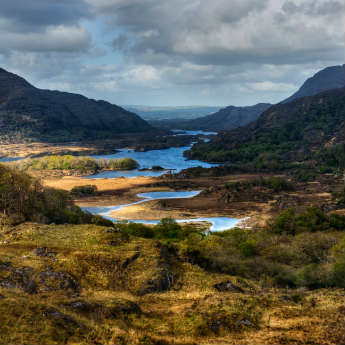 If not, which thermal pool that you've visited would make it onto this list? We'd love to know which one is your favourite!